No matter how old I get, the word “sausage” will probably always make me giggle a little bit—for obvious reasons. There’s really no way around it. I have accepted this about myself. I first got the idea for this soup from a recipe I saw on How Sweet It Is, which calls for spicy Italian sausage and whole wheat orecchiette. However, instead of pasta, I decided to use up some brown rice that had been in my cupboard for well over a year. I actually decided to throw out the orecchiette in there because it finally dawned on me that almost all of the not very many relationships I’ve had in the past few years ended within days of sharing a meal that contained said orecchiette, and well, f*** that. It’s 2014. I need a new pasta shape in my life. Energetically speaking, I’m sure there’s something not good about eating pasta that looks like ears, maybe to do with hearing/listening/being heard. I don’t know—I’m over-thinking this, clearly. Let’s just say I’m ready to actually learn from my mistakes by not making bad-karma-pasta anymore. Maybe I also should enforce a new rule about not making pasta too early in a relationship, since the one that did not end with orecchiette ended with ravioli. You can also play around with using different greens if kale’s not your thing or if you got spooked by that article you read a few weeks ago. Heat oil in a large stock pot. add garlic, onion, celery, carrot, and leek. Cook until onion is translucent and veggies begin to soften. Stir in spices, lentils, rice, and sausage. Cook another minute or two before adding liquid. Bring to a boil. Reduce heat and stir in kale. Allow to simmer ~30 minutes. What’s your favorite joke? Does “sausage” make you giggle? Which pasta shape should I try next? 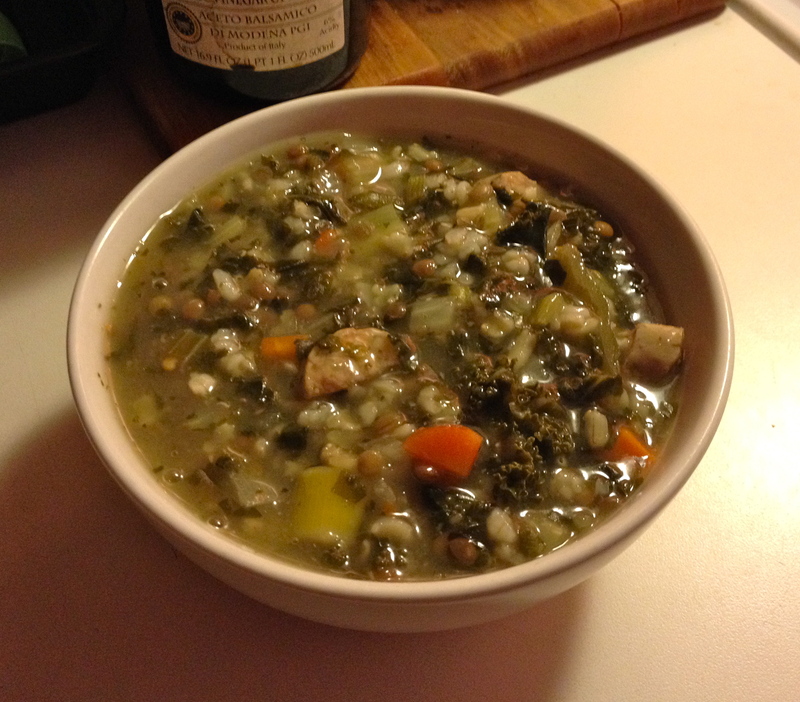 This entry was posted in Uncategorized and tagged cooking, dating, kale, recipe, sausage, soup. Sounds like you had a total sausage fest. Snort. I actually once got “in trouble” once for saying a party my then-boyfriend took me to was “a total sausage fest” because I was the only girl there. He was mortified and lectured me on the way home. In college, my friends and I used to jokingly say that all the time since most the group I hung out with were, in fact, guys. I had no idea it was, like, a mean thing to say! I don’t find it mean either! I just take it to mean there’s lots of men there, that the ratio is skewed. There’s not such an easy female counterpart to that phrase, but doesn’t mean it can’t be true!